“Location, location, location” works as well for parks as it does for businesses. 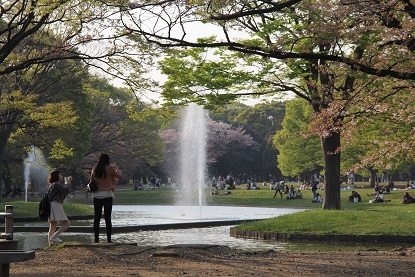 Yet, an ideal location―adjacent to the Meiji Shrine and around the corner from popular Harajuku―is not the only strength of Yoyogi Park, the fourth largest park within Tokyo’s 23 wards. The wide lawns invite sports enthusiasts, as well as picnic-goers. Visitors can stroll over the tree-lined grounds or along the park’s water corridor and rental bicycles are available as well. Three park fountains also spray water as high as 30 meters. The park can be crowded on weekends, but spacious Yoyogi has plentiful room for everyone.